This illustrated list is intended to give some indication of the scope and quality of Bussey's work. The pictures are arranged in chronological order. Here is an introduction to Reuben Bussey's work. 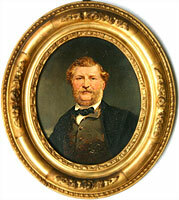 Reuben Bussey was born 12 February 1818 at Nottingham. and Ann Bussey. 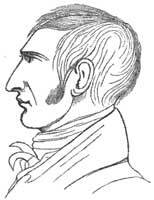 William Bussey ran a cork cutting business in Nottingham. Reuben's early talent was recognised and he was given support to study in London. Bussey appears to be in his twenties. 250 × 185 mm. Oil on canvas. Probably 1840s. 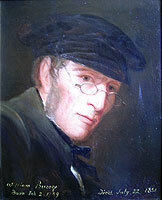 Portrait of the artist's father William Bussey who lived 1789 - 1851. 385 × 310 mm. Probably the same picture included in the 'Special Exhibition of works by Reuben Bussey' at the Castle Museum, February 1894, lent at that time by Mrs Reuben Bussey. No 1 in catalogue. John Ward. Born Jan 27th 1790; Died Oct 21st 1860. The Artist's Uncle. Probably 1840s. Included in the 'Special Exhibition of works by Reuben Bussey' at the Castle Museum, February 1894, lent at that time by Mrs Reuben Bussey. No 29 in catalogue. Sold at Christies 3 April 1964 by Laurence Brook. 20 × 27 inches. Phrenology was popular at the time. The attempt to link criminal behaviour to features of the head is discredited today. Caesar and Pompey crossing the Trent near Wilford Ferry, Nottingham 1844. Described in the text of Heather Williams's 1981 thesis. Exhibited at Birmingham. A Cavalier. Oil painting. 1845. Included in the 'Special Exhibition of works by Reuben Bussey' at the Castle Museum, February 1894, lent at that time by Mr Chas R Attenborough. No 34 in catalogue. home from London and assist in running the family cork cutting business. Reuben married Elizabeth Ward in 1847 at Nottingham. His father died in 1851 at Lister Gate. About 1860 Reuben resolved to become a professional artist. Along the coast 1854 The Artinfo website gives these auction details which are probably the same picture: (1) Along the coast, Paintings (1854) Doyle New York Dec 01, 1982 1,300 USD (1) By the coast, Paintings (1854) Sotheby's Jan 22, 1982 1,000 USD. Pug's Dinner Party. Oil painting. 1860. Included in the 'Special Exhibition of works by Reuben Bussey' at the Castle Museum, February 1894, lent at that time by E Egerton Leigh. No 54 in catalogue. The scene is probably St Peter's Church Walk. Approx 310 × 205 mm. 29 May is 'Royal Oak Day' or 'Oak Apple Day'. It celebrates the escape and restoration of King Charles II. The day was was expunged from the church calendar in 1859 and Bussey's picture could be interpreted as an attempt to keep the celebration alive. 30 × 25 inches. 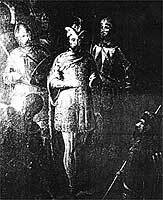 Henry II granting the Great Charter to the Burgesses of Nottingham in Nottingham Castle. AD 1155. Oil painting. 1863. Included in the 'Special Exhibition of works by Reuben Bussey' at the Castle Museum, February 1894, lent at that time by Mr James Ward. No 17 in catalogue. Portrait of a chestnut horse outside a stable with two terriers. Artnet website says this was auctioned, probably in 2012, 18 × 22 inches. It may be the same picture as 'Study of a Horse' included in the 'Special Exhibition of works by Reuben Bussey' at the Castle Museum, February 1894, lent at that time by Mr Lionel Gyngell. No 37 in catalogue. A Distant View of Hardwick Hall. A timber wagon being loaded in the foreground 1865. Listed in card index at Nottingham Local Studies Library. 19.5 × 32.5 inches. This is probably the same as these auction details from the Artinfo website: (1) Distant view of Hardwick Hall, Paintings Sotheby's May 12, 1965 100 GBP; (2) Hardwick Hall, Derby; Paintings (1865) Young Fine Arts Auctions Nov 30, 1985 700 USD. This may be the same as the oil painting titled 'Hardwick Hall' included in the 'Special Exhibition of works by Reuben Bussey' at the Castle Museum, February 1894, lent at that time by Mr Reuben Harris. No 26 in catalogue. Listed online at Bridgeman Art Library. The Artnet website gives other details: (1) sold Phillips London, Tuesday, June 21, 1994 with the title: "A Chorus of Dogs"; (2) sold Phillips London, Tuesday, October 11, 1994 with the title: "A Chorus of Dogs" 1600 GBP; (3) sold Christie's South Kensington: Thursday, April 4, 1996 with the title "Twenty Dogs" 1600 GBP. 14.2 inches in diameter, signed and dated 1865. The picture appears to show the Major Oak. For more information on this famous tree in Sherwood Forest, Nottinghamshire see the Nottinghamshire County Council website and Find the Major Oak. Signed R. Bussey and dated 1866 in the bottom left hand corner. Purchased in 2008 from the Red House Antiques Centre in York, England. 380 mm by 280 mm. Shows 'an old mill house with water running through and under bridge with a lady crossing the bridge holding a basket'. For more information see the website for Holy Trinity Church, Bulcote, Nottinghamshire. Reproduced with grateful thanks to John Fisher and the Bulcote Church. Rural scene Oil. 1867. Auctioned by Arthur Johnson & Sons Nottingham in 1991. 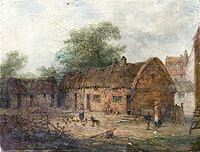 Rural scene showing cottage with people outside with hilly countryside. The Lovers Oil on canvas. 1867. Internet auction 2005. 20 × 34 inches. 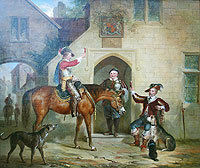 Figures and cattle before Haddon Hall 1868 The Artinfo website gives these auction details: Figures and cattle before Haddon Hall, Paintings (1868) Phillips DEC 14, 1981 400 GBP. One of the monochrome illustrations in Heather Williams's 1981 thesis. Discussed in detail by her. Sold at Christies April 1916 by J Goodwin Esq. 51.5 × 77 inches. Probably the same oil painting titled included in the 'Special Exhibition of works by Reuben Bussey' at the Castle Museum, February 1894, lent at that time by Mr John T Goodwin. No 42 in catalogue. An article in the Nottinghamshire Guardian for 22 October 1869 tells us that the picture was exhibited that year at the Nottingham School of Art. 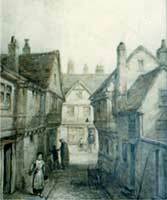 The article praises the picture and explains its importance to the history of Nottingham. The picture is also mentioned briefly in the same newspaper on 1 October 1869. Figures in 16th century costume on the battlements of a castle, a marine landscape beyond Oil on canvas. 1870. 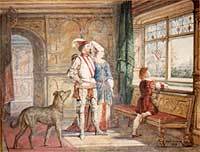 Auction detail from Artinfo website: Figures in 16th century costume on the battlements of a castle, Paintings (1870) Dukes Auctioneers Oct 31, 2002 400 GBP. Described in the text of Heather Williams's 1981 thesis. Used to hang in Nottingham Library. The picture was painted in 1870 but recreates a scene imagined from 1842. Included in the 'Special Exhibition of works by Reuben Bussey' at the Castle Museum, February 1894, lent at that time by Mr John T Goodwin. No 33 in catalogue. Dimensions given as 61 × 50.8 cm. Reproductions of this picture available from the Media Storehouse. Reproduced on the BBC Your Paintings website. 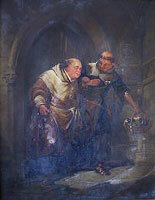 Auction detail from Artinfo website: Scene from Henry IV, Paintings (1873) Auktionshaus Weidler Sep 14, 2002 520 EUR. Reuben painted another picture with almost the same title. This is mentioned in an article in the Worcester Journal for 6 June 1868. It lists prizes for the 'Art Union of Great Britain'.. The third prize is "'Scene from King Henry IV' value 100 guineas, by Reuben Bussey ...and well bears out the reputation this rising artist has acquired ..."
There are two pictures with almost the same title. (1) 20.25 × 32 inches. ArtInfo website says sold Brightwells Apr 27, 2005 480 GBP. (2) 120 × 100 cm. University of Nottingham collection. No date given. Reproduced as a larger image on the BBC Your Paintings website. One of these is probably the same oil painting included in the 'Special Exhibition of works by Reuben Bussey' at the Castle Museum, February 1894, lent at that time by Mr Parker Woodward. No 49 in catalogue. The Nottingham Evening Post for 20 May 1893 describes the local artists' exhibition that year. One of Bussey's pictures was included posthumously. 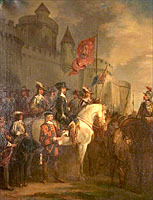 It is the same subject: "...a powerful oil-painting (unfinished) by the late Mr Reuben Bussey, depicting the raising of the standard by Charles the First at Nottingham in front of the Norman Castle..." Does this refer to one of these pictures, or to yet another on the same subject? Oil on canvas. About 1874. 37.5 cm × 31.5cm. Signed 'R Bussey' in the lower RH corner. The picture does not carry a name or a date. It is known as 'The Armourer' to the present owners. 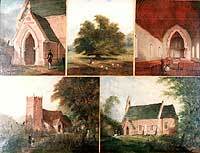 The painting was either bought by or given to the Rev Fred Binns who was minister of the St James Street Congregational Church in Nottingham between 1874 and 1878. He migrated to Australia in 1890 where he became a senior member of the Congregational Church. One of his sons, Kenneth Binns CBE became Australia's first National Librarian. The picture is still in Australia. Bussey did at least one other picture on the same subject. 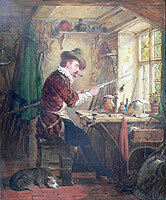 'Richard Bullyvant' exhibited in 1882 was said to show the town armourer in the time of James I. Then at Bussey's posthumous exhibition in 1894 the catalogue lists (with water colours and drawings): 'No. 65 - Bullivant the Town Armourer: the first man who smoked tobacco in Nottingham. Lent by Councillor J H Brown'. 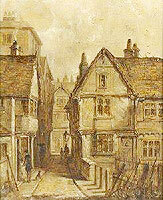 Probably the same picture included in the 'Special Exhibition of works by Reuben Bussey' at the Castle Museum, February 1894, lent at that time by Mr John T Goodwin. No 18 in catalogue. Sir Richard Byron repelling a sortie from Nottingham Castle - Civil War 1643. Oil painting. 1875. Included in the 'Special Exhibition of works by Reuben Bussey' at the Castle Museum, February 1894, lent at that time by Mr John T Goodwin. No 39 in catalogue. Described in an article in the Nottingham Journal on 5 July 1875: '...in old Hounds Gate when the king's soldiers are repelling a sortie from the castle, then held by Colonel Hutchinson. The first Lord Byron is seen on horseback giving instructions to his troops...'. Falstaff and Prince Hal with their Friends at a Tavern 1875. Sold at Christies 12 March 1965. 19.25 × 30.5 inches. This picture is described in some detail in an article in the Nottingham Journal on 5 July 1875. 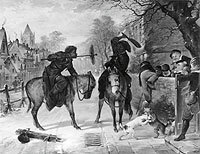 The article also describes other pictures seen in Bussey's studio: (1) a civil war battle in Hounds Gate, Nottingham, (2) a landscape set at Birklands, (3) a sketch of Lady Macbeth, (4) sketches for a planned series of paintings on the history of Nottingham Castle. St Paul dictating his Epistle to the Romans AD 60. Oil painting. 1876. Included in the 'Special Exhibition of works by Reuben Bussey' at the Castle Museum, February 1894, lent at that time by Mr John T Goodwin. No 36 in catalogue. Cellarman of the Olden Time. Ancient bottles of abbey wines returning from duty about 1296. Oil on canvas. 1877. Inscribed, signed and dated 1877 verso. Details from catalogue, Anthemion Auctions 21 July 2010. Scriptural subject: 'And Micaiah said: "What the Lord saith unto me, that will I speak."' Oil painting. 1878. Included in the 'Special Exhibition of works by Reuben Bussey' at the Castle Museum, February 1894, lent at that time by Mr W Herbert Smith. No 10 in catalogue. No. 76 in 1913 catalogue of Nottingham Castle Art Museum. Reg.No. 1909-70. Bequeathed by Mr J R Wild. Size 12.25 × 15.75 inches. Included in the 'Special Exhibition of works by Reuben Bussey' at the Castle Museum, February 1894, lent at that time by Mr J R Wild. No 61 in catalogue. Pen and ink drawing. 1878. No. 77 in 1913 catalogue of Nottingham Castle Art Museum. Reg.No. 1909-71. Bequeathed by Mr J R Wild. Size 10 × 14.75 inches. No. 78 in 1913 catalogue of Nottingham Castle Art Museum. Reg.No. 1909-72. Bequeathed by Mr J R Wild. Size 12.25 × 15.75 inches. Included in the 'Special Exhibition of works by Reuben Bussey' at the Castle Museum, February 1894, lent at that time by Mr J R Wild. No 62 in catalogue. 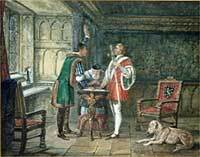 Sketch for 'Clifton Hall', Sir John Byron and Sir Jervais Clifton, The Oath at Clifton Hall, August 21 1485. No. 79 in 1913 catalogue of Nottingham Castle Art Museum. Reg.No. 1909-73. Bequeathed by Mr J R Wild. Size 9.75 × 14.5 inches. No. 80 in 1913 catalogue of Nottingham Castle Art Museum. Reg.No. 1909-74. Bequeathed by Mr J R Wild. Size 20.25 × 28.5 inches. Included in the 'Special Exhibition of works by Reuben Bussey' at the Castle Museum, February 1894, lent at that time by Mr J R Wild. No 63 in catalogue. May be similar to an oil painting titled 'The Coast, near Caister, Norfolk' included in the 'Special Exhibition of works by Reuben Bussey' at the Castle Museum, February 1894, lent at that time by Mrs Reuben Bussey. No 12 in catalogue. One of the monochrome illustrations in Heather Williams's 1981 thesis. 20 × 32 inches. Auctioned at Neales, Nottingham on 27 April 2007. Description says 'Signed, dated 1879 and inscribed with title verso 49 cm × 80 cm'. Sold for 400 GBP. The picture was one of three exhibited in 1879 in an exhibition for local artists at the Castle Museum. An article in the Nottinghamshire Guardian for 9 May 1879 complains about its use of colour which was not to the reviewer's taste. Great Council at Nottingham Castle, 1176 About 1879. The picture was one of three exhibited in 1879 in an exhibition for local artists at the Castle Museum. It is mentioned in an article in the Nottinghamshire Guardian for 9 May 1879. Like 'The Royal Proclamation' the reviewer complains about its use of colour. A Glade in Merrie Sherwood About 1879. The picture was one of three exhibited in 1879 in an exhibition for local artists at the Castle Museum. An article in the Nottinghamshire Guardian for 9 May 1879 considers it the 'best effort' of the three..
One of the monochrome illustrations in Heather Williams's 1981 thesis. 20 × 32 inches. Sold at Neales of Nottingham in 1978. Drawings illustrating Nottingham Castle in the Olden Times. A series of at least 12 drawings. About 1880. The drawings were mentioned as a future project in an article in the Nottingham Journal on 5 July 1875. 3 frames each with 4 drawings were included in the 'Special Exhibition of works by Reuben Bussey' at the Castle Museum, February 1894, lent at that time by Mr Albert Heymann. Nos 84-86 in catalogue. See that catalogue for much detail. 27in. by 35in. Auctioned in 1994 by Heathcote Ball, UK. Our Saviour at the Well of Samaria. Oil painting. 1880. Included in the 'Special Exhibition of works by Reuben Bussey' at the Castle Museum, February 1894, lent at that time by Mrs Reuben Bussey. Nos 8 in catalogue. On the Marsh, near Yarmouth Watercolour drawing. 1880. Listed in Nottingham Local Artists Exhibition catalogue for 1880. The Beach, Yarmouth Watercolour drawing. 1880. Listed in Nottingham Local Artists Exhibition catalogue for 1880. From a bound volume 'Sketches' in private collection. This is also the title of a watercolour drawing dated 1880 listed in Nottingham Local Artists Exhibition catalogue for 1880. Richard I with mother in castle. Oil on canvas, titled, signed and dated verso 1880. Macbeth 1881. The picture was one of two exhibited in 1881 in an exhibition for local artists at the Castle Museum. It is mentioned in the Nottingham Evening Post for 2 May 1881 where the reviewer considers it the poorer of the pair. Sir John Falstaff and Bardolph. 1881. The picture was one of two exhibited in 1881 in an exhibition for local artists at the Castle Museum. It is mentioned in the Nottingham Evening Post for 2 May 1881 where the reviewer considers it the better of the pair. The picture was exhibited in 1882 in an 'Autumn Exhibition of Modern Pictures' at Nottingham. It is described in the Nottinghamshire Guardian for 15 September 1882. The picture shows the town armourer in the time of James I.
Bussey's obituary in the same paper on 4 March 1893 mentions a watercolour with a similar title, and possibly the same picture. According to Wikipedia "A dog whipper was a church official charged with removing unruly dogs from a church or church grounds during services". A sluggard wakener might have been somebody who woke those who fell asleep during services. This is how the owner describes the painting: "a rather grim Dickensian figure, with whip and cane... is seated on a stool... with a flagstone floor and a large pillar, with some interesting woodwork in the background. A leather-bound book, probably the bible, sits alongside him .... The painters signature is neatly framed by one of the flagstones. It is not a large picture." Included in the 'Special Exhibition of works by Reuben Bussey' at the Castle Museum, February 1894, lent at that time by Mr John T Goodwin. No 15 in catalogue. Richard III leaving Nottingham Castle for Bosworth Field, August 21st 1485. Oil painting. 1882. Included in the 'Special Exhibition of works by Reuben Bussey' at the Castle Museum, February 1894, lent at that time by Mrs C L Davis. No 30 in catalogue. 450 mm × 593 mm. Probably the same oil painting included in the 'Special Exhibition of works by Reuben Bussey' at the Castle Museum, February 1894, lent at that time by Mr John T Goodwin. No 32 in catalogue. 13 inches × 9 inches. From a leather bound notebook 'Pen & Ink Sketches by Reuben Bussey 1882' in a private collection. Most of the sketches were done in Great Yarmouth. Approx 310 × 205 mm. There is also a sketch for this picture. Oil on earthenware plate. Dated 31 May 1883. The date is the birthday of Polly Derry and the picture may have been given to her. 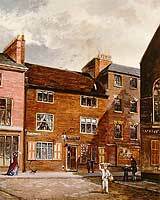 The names 'Bussey' and 'Tantum' appear on shop fronts in the picture, although it unlikely any Busseys were living in Nottingham in 1700. Described in the text of Heather Williams's 1981 thesis. Untitled but appears to show the main gate to Nottingham Castle. Auctioned at Nottingham in 2012. Signed and dated in bottom left. MacBeth and Lady MacBeth Pair of oval portraits on single canvas, signed, 1884. Each portrait 10.5in × 8in. Auctioned by David Duggleby, Scarborough, UK in 2001. Inscribed signed and dated 1884.. May have been sold again in 2011. The Weird Sisters 1884 This is one of two pictures by Bussey exhibited at the Nottingham Castle Museum in 1884. It is described in the Nottinghamshire Guardian for 16 May 1884. "...the three witches in Macbeth. They are 'secret, black and midnight hags' in very truth; ugly enough to frighten ..."
The location is uncertain. The inscription appears to say 'Nr Simerleyton, Surrey' but it is probably Somerleyton in Suffolk. Old Jerry the grave digger at St Peters 60 years ago. A childhood recollection of St Peters churchyard close to where Reuben grew up in Nottingham. Another childhood memory of a visit to a shop. On the 1851 census Lucy Milward is a widow living in Nottingham St Peter. She was a tallow chandler born about 1790 in Loughborough. My dear friend was sick - I visited him. Sketch. Dated 28 January 1886. The sick friend in the picture may be Joseph Derry the printer. Approaching old age, Reuben is illustrating Shakespeare's last play. Reuben had no children but the father-daughter relationship of Prospero and Miranda may have reminded Reuben of his relationship with Polly, now a young woman. This may be one of two pictures exhibited at the Nottingham Castle Museum in 1884. It is described in the Nottinghamshire Guardian for 16 May 1884. "In monochrome is dainty..."
Oil on earthenware plate. 1886. Although the title and subject are the same as the sketch, the expressions are quite different. The carefree Miranda of the sketch has become the dutiful and attentive daughter. Reuben's pictures often have dogs - here the dog steals the scene. Written on the sketch for the painting is the quotation is "O,tis a foul thing when a cur cannot keep himself in all companies!". In this scene, Launce names his dog as Crab. Launce was servant to Proteus, one of the Two Gentlemen. The Cauldron Scene 1887 This is one of several pictures by Bussey in the local artists exhibition at Nottingham Castle Museum in 1887. It is described in the Nottinghamshire Guardian for 20 May 1887. "...Hecate and the witches are making their 'hell-broth'. ...lurid lights and deep shadows..."
Sketch. Dated '1888 at 70'. This comic fantasy appears to show Reuben selling his pictures on the street. It hints at a fear of old age and poverty. Oil on wood. Probably 1880s. The last known self portrait. Reuben also appears in several photographs about this time. The picture was once in the possession of Gladys Pentecost, great niece of Reuben's wife Elizabeth. Included in the 'Special Exhibition of works by Reuben Bussey' at the Castle Museum, February 1894, lent at that time by Mr John T Goodwin. No 44 in catalogue, given the title 'The Rat Catchers'. The title on the back of the picture is 'The Rat Catcher'. Going To The Fair, Travellers with their carts, animals and dogs Oil. 1890. 13in × 16.5in. Details from Neales of Nottingham auction catalogue 19 July 2002. May be the same oil painting titled 'Going to the Fair' included in the 'Special Exhibition of works by Reuben Bussey' at the Castle Museum, February 1894, lent at that time by Mrs Reuben Bussey. No 16 in catalogue. 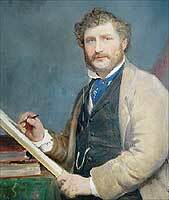 Reuben died 1 March 1893 at Nottingham. It has not been possible to date the pictures listed below. Approx 660 × 460 mm. Near Budby, Sherwood Forest, Notts. Approx 500 × 240 mm. 250 × 500 mm approx. 300 × 200 mm approx. The Arrest of Roger Mortimer, Earl of March, at Nottingham Castle. October 17 1330. One of the monochrome illustrations in Heather Williams's 1981 thesis. Original 30 × 24.75 inches. Williams's notes Bussey painted several versions of this scene. A drawing with the same title was included in the 'Special Exhibition of works by Reuben Bussey' at the Castle Museum, February 1894. No 84/7 in catalogue. 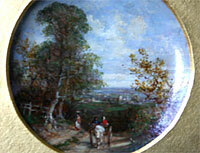 Sold at Neales of Nottingham auction February 2005, 36.5 × 30.5 cm. The street is probably St Peter's Gate looking towards Bridlesmith Gate. 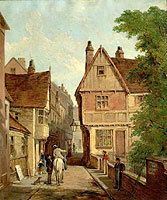 Note there are several features in common with 'Street scene in Nottingham' painted in the 1860s (see above) including the three posts at the end of St Peter's Church Walk. Sherwood Forest in the olden times Oil painting. Included in the 'Special Exhibition of works by Reuben Bussey' at the Castle Museum, February 1894, lent at that time by Mrs Reuben Bussey. No 13 in catalogue. Coastal Scene with fishermen and boats Oil on canvas Signed. 48cm × 78cm. Auctioned by Hampton and Littlewood, UK, 2008. Sherwood Forest, King Richard I with Robin Hood and others Auction detail from Artinfo website: Sherwood Forest, King Richard I with Robin Hood and others, Paintings Neales Jul 18, 2002 370 GBP. Water Mill Private collection. Shows a mill with mill wheel and stream. A figure stands on the left. This is a different mill from Staunton Mill in the 1882 picture. Click on the image to view the photographs. See also the Catalogue of the 1894 Special Exhibition (download this as a pdf file 3.5MB). This list was compiled by Richard Phillips and is based on information available to him at the time. There are certainly many more pictures by Reuben Bussey in existence and Richard would welcome additional information to build up as complete and accurate an overview as possible. The copyright of the photographs belongs to the owners of the pictures unless indicated otherwise. Please email Phillips@badsey.net. Grateful thanks to everyone who has provided information about Reuben Bussey and images of his pictures including Lee Attwood, David & Lindsey Bailey, John Beale, Hilary Bussey, Renzo Coira, Sylvia and Peter Derry, Alan Goodwin, Fiona Goodwin, Wendy Hussein, Stephen Kibbey, Judith Mills, Brian Nash, Graham Pugh, George Roberts, Richard Smith, David Turner, Neil Walker, Margaret White and Deborah Wyatt. Return to the Reuben Bussey home page.